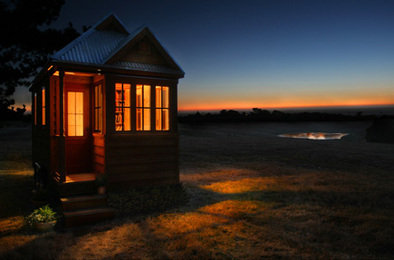 Check out this great article on small houses creating more freedom. It’s an interesting concept and sure would be LESS to clean! Jay Shafer is a designer of tiny houses, so small some might laugh when they first see the 89 square-foot house on a trailer, but there is something undeniably practical and sane about what he is doing. The term McMansion was created from the trend of building larger and larger homes that waste both land and materials. Jay’s homes take an opposite stance on the “bigger is better” mentality. A recent study indicated that 1.2 million households were lost during the current economic recession, in part due to mortgage size. If those homes had been much smaller, with proportional mortgages, perhaps some of the economic downfall could have been avoided. One of Jay’s small houses costs only about $48,000. If you build it yourself, the cost is only $21,000. You can see an online journal about building one here. Of course, smaller homes require less energy to heat and cool. The interview with Jay below provides some insights in how a person might start to change his or her mindset about home ownership in America. What do you like best about having a smaller home? The best part is the freedom. I’m no longer burdened by a mortgage and extra stuff. Are there any permitting issues potential buyers should be aware of when considering your homes? I put my house on wheels to bypass laws that prohibit houses from being this small. So long as a trailer can be parked on a lot, my house is permitted there too. The larger houses, I design on foundations that meet minimum size standards. Which ones are people buying most now? Most folks buy the biggest of my tiny designs. Not everyone’s meant for 89 square-feet. What kind of materials do you use in your designs? Most of the materials I use are standard, but I usually get certified lumber and recycled stuff when I can. What sparked you to start making very small houses? I built my first house for myself, and it seemed that a lot of my friends liked the idea, so I just kept building. Is there any connection between your experiences in childhood or youth, and what you do now? I was raised in a 4000 square foot house and did quite a bit of the cleaning. Have you met any resistance along the way to your different ideas? People seem to understand the environmental and practical advantages of living small. It’s the building codes and zoning that need to catch up. I imagine tiny house communities popping up everywhere. Maybe a new and improved trailer park will be viewed as a part of the future American dream.